rice pudding. you either love it or you hate it. not many people have moderate feelings about rice pudding. i love it. everybody else in the house (except mark) hates it. because of the majority disdain, it's not on my regular rotation of desserts. 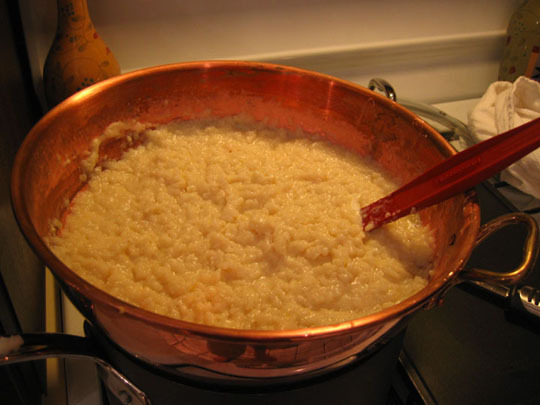 but that has not stopped me from trying many, many rice pudding recipes over the past couple years mainly, trying to find a rice pudding recipe that, for me, is perfect. i've tried different rices, different cooking methods, all kinds of different things. nothing's worked for me. too dry, not sweet enough, too crunchy. nothing's worked. until last saturday. i was watching paula deen ("paula's home cooking" on the food network). i knew this was what i was looking for. i knew i'd need to cut out the raisins and the fruit sauce (and add a little lemon zest); but i knew that the cooking method (double boiler) and the sweetener (sweetened condensed milk) were the tricks i was looking for. oh. finally got to making it tonight, and it's PERFECT! creamy. sweet. perfectly cooked rice. try this one. even if it's just for you. Put the rice in the top of a double boiler set over simmering water. Add the salt and 3 cups of boiling water. Cover and cook until the rice is tender, about 30 minutes. Stir in the condensed milk, butter, and raisins. Cook, stirring frequently, over simmering water until the pudding thickens slightly, about 20 minutes. Remove the pot from the heat and stir in the vanilla and nutmeg. Spoon the pudding into individual custard cups and refrigerate until ready to serve. Invert puddings onto chilled plates and serve with fruit sauce. Combine the orange juice, sugar, and cornstarch in the top of a double boiler. Cook the mixture over simmering water until it thickens. Remove the pot from the heat and stir in the lemon juice, butter, and rum extract. Serve warm over rice pudding garnished with stewed fruit, if desired.